Fashion has changed a lot over the last several century's, but the changes of the early 20th century was such a huge shift compared to previous fashion trends. Skirts got more narrow than ever before and shorter styles started becoming normal. But what exactly caused this drastic change of fashion? Women in particular were affected by the new fashions. Showing so much as your ankle's was considered immodest for the majority of the 19th century (with exception of the 1820's-40's where skirts were relatively shorter, stopping right at the ankle), yet soon, skirts began to rise. Let's start with what fashion looked like at the end of the 19th century, specifically the 1890's. Starting with the undergarments. Clothing starts with the undergarments, which help to create the right silhouette (shape) of the garments worn on top. Women's undergarments during this time usually consisted of a chemise, drawers, or combinations which is a single piece with both the drawers and chemise sewn as one. On top of this would be a corset, bonned with either whale bone or steel boning. Next a small bustle could be attached around the waist. The bustle was a popular style from that lasted from the end of the 1860's through most of the 1880's, and by the 1890's it had shrunk to a much smaller size. After this a series of petticoats would be put on, completing the undergarments. 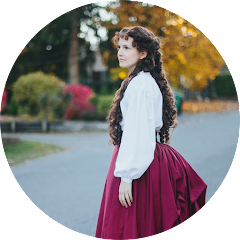 Dresses for this era had large skirts that were wide at the bottom and narrow around the top, and bodices were long with large, puffed sleeves and high necklines. Around 1905, the skirts started slimming and continued to become more slim until WWI in 1914. The undergarments were similar to that shown previously, although the shape and fit had changed. But women still wore a chemise, drawers, and corset underneath all of their clothes. When WWI began, it effected every aspect of life. During this time fashion became more simple and women's clothing started to be designed for movement, freedom and functionality. Some styles even began imitating men's styles. This was also when the Women's Sufferage became a mass movement. Women didn't have the power to vote at the time and had considerably less rights then men, and part of that inequality came through fashion. Up until then most fashion designers were men, which meant the fashion standards and idea's were largely decided by men. Women designers like Coco Chanel began gaining traction with their designs after the turn of the century, which would change fashion forever. In the 1920's women's fashion began to change far more than it ever had. When most people think of the 20's they think of the classic flapper girl, although this style didn't come about until 1926 it still remains an iconic style. Fashion in this time was very loose and not nearly as restrictive as it had been. Skirts were shorter, necklines lower, and undergarments were lighter, though corsets and new versions of corsets were still worn through the 1950's. Skirts were still fairly long through the 30's, sitting around the ankle or mid calf, until WWII began and fashions changed once again, however that's whole other post in itself. I often hear people say things like "Why can't we wear clothes like that now?" or "This should never have gone out of fashion", and as much as I wish we still took the time to look our best and take pride in how we presented ourselves, it wouldn't be practical in the modern day we live in. Between the hectic lives we live and our modern way of living, it would take way too much time, space and money. Technology also had a big impacted fashion. With the invention of the automobile, it wasn't practical for women to wear skirts made of yards and yards of fabric, or large skirt supports like bustles and cage crinolines that were needed to support them. And in this day and age it's pretty much near impossible to live without a vehicle of some sort. Fashion is both a reflection of the times as well as a result of the age we live in. Events often dictated what come's into style, which sometimes lasts and sometimes only stays for a short while before changing once more.